The last book of this series was great, but I did expect it to be better. To me, I felt like the beginning was very slow and I just couldn't get into it until almost halfway through. The main reason I like reading Young Adult literature is because of the relationships. 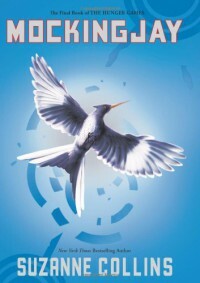 Now, I know that not every book needs that damsel in distress and Katniss is amazing and so strong at who she is, but I really felt like this book was more based on the politics of Panem and the Capitol instead of rebuiling the relationship with the ones she loves, when it came down to it in the end, I feel the ending was very quick and rushed. Aside from all of that, I did come to terms with what the ending was and there were a very twists to the story that really got my attention. After getting through a certain point in the book, I just couldn't put it down! !